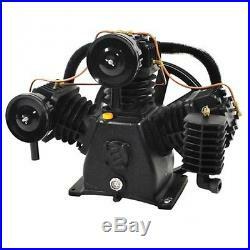 7.5HP 3 Cylinder 2 Stage Air Compressor Pump. &###x200B;&###x200B;&###x200B;&###x200B;&###x200B;&###x200B;&###x200B;Factory Direct Prices&###x200B;&###x200B;&###x200B;&###x200B;&###x200B;&###x200B;&##x200B. 32CFM Air Compressor Pump. Ram-Tek – solid steel, heavy gauge rods, designed for maximum performance and durability. Cool-Tek – the coolest running compressors in the industry, air stream technology provides 35% lower operating temperature, reduces moisture build up and extends pump life. Flow-Tek – concentric disc valves, deliver maximum air flow and reliability with low replacement costs, easily accessible design provides easy maintenance and durability. Industrial grade ball bearing for maximum performance and extended pump life. Built-in head unloaders designed for continuous run applications. Bolt pattern: 9 7/8&###x201D; side to side, 6 &###xBD;&###x201D; Front to back. Flywheel included on pump. Solid cast-iron cylinders, crankcase, flywheel, crankshaft, and valve plates. Large Steel Automotive-Type Filters &###x2013; not plastic. Large site glass for viewing your oil level. Dimensions of this pump are: 25&###x201D; W x 13&###x201D; D x 18&###x201D; H. Includes oil – holds 2 quarts of oil. &###xA0;&###xA0;&###xA0;&###xA0;&###xA0;&###xA0;&###xA0;&###xA0;&###xA0;&###xA0;&###xA0;&###xA0;&###xA0;&###xA0;&###xA0; Our 3 Cylinder Heavy industrial air compressor pump with 32 CFM Displacement and a Free Air (usable air) of 26 CFM at 100 PSI can&###x2019;t be beat. Don’t be tricked by air compressor dealers giving you CFM Displacement and you think you are getting the Free Air… And you are really not. &###xA0; For instance, this pump has&###xA0;32 CFM Displacement. &###xA0; I have seen companies advertise this as “32 CFM at 125 PSI”–this is not true! &###xA0;&###xA0;Displacement is the bore of the cylinder times the distance in the piston stroke times the RPM at zero pressure, but as you go up in pressure, you will&###xA0;lose efficiency on your pump. &###xA0; The CFM will diminish from 32 to&###xA0;26 at 90 PSI. &###xA0; We give&###xA0;you the “Free Air” at Pressure and the CFM Displacement–NOTRICKS!!! &###xA0; This pump has a maximum PSI of 150. The minimum RPM is 600 and a maximum RPM of 840. This pump is all cast iron. &###xA0; When we say&###xA0;ALL CAST IRON, (not aluminum) that is what we mean. &###xA0; It has solid cast iron cylinder, cylinder heads, crankcase, flywheel, crank, and forged steel connecting rods &###x2013; not aluminum! &###xA0; 99% of the pumps you see on the market today have aluminum rods. &###xA0; This style rod does not come close to a forged steel rod. &###xA0; I have seen many compressors over the 26 years of building compressors, and many of them break &###x2013; aluminum rods. &###xA0; However, I have NEVER seen a steel connecting rod fail in one of our pumps. &###xA0; These rods also have a replaceable bearing on the crank journal and on the wrist pin journal. &###xA0; This is what most of the competition do not have. &###xA0; Our trained service and support team is ready if you ever need them and we carry a full line of new replacement parts. &###xA0;&###xA0;&###xA0;&###xA0;&###xA0;&###xA0;&###xA0;&###xA0;&###xA0;&###xA0;&###xA0;&###xA0;&###xA0;&###xA0;&###xA0; Eaton Compressor delivers overwhelming performance to ensure that they meet the needs of the most demanding environments. Our Pumps require less maintenance, service and downtime than any other compressors in the Air Industry&###x2019;s. All our Products are designed with exacting tolerance and specifications to deliver all the power that is needed at the jobsite, garage or shop. &###xA0; &###xA0; &###xA0; &###xA0; &###xA0; &###xA0; &###xA0;&##xA0. This pump can be run with a gasoline engine. &###xA0; It is set up with head unloaders. &###xA0; This will allow the pump to unload the valves in a continuous run application. &###xA0; This is on top of the heads with the small 1/4 lines connecting them. &###xA0; This also allows for complete unloaded, no load start, easy on your gasoline engine starter. &###xA0; You must have an 8-10 HP to run this at a minimum RPM and a 13 HP to run it at maximum RPM. &###xA0; To gauge your motor HP, check the amperage on 220V. &###xA0; It takes&###xA0;21 amps (running amps) to pull this pump at a 640 RPM speed. &###xA0; The motor used to do this should be a 1750 RPM, 184-T Frame. &###xA0; It will give you a much higher starting torque than a 3450 RPM motor. &###xA0;&###xA0;For an 840 RPM speed, you should use a TRUE 7.5 HP, 32-amp, 215-T Frame, 1750 RPM motor. &###xA0; A 3450 RPM in this HP is also not recommended because of lower starting torque. See our other items. Item location: Clayton, Ohio, United States. Ships to: United States. –includes oil – holds 2 quarts of oil —73 DBA &###x201C;Free Air&###x201D;: Our 3 Cylinder Heavy industrial air compressor pump with 32 CFM Displacement and a Free Air (usable air) of 26 CFM at 100 PSI can&###x2019;t be beat. For instance, this pump has 32 CFM Displacement. I have seen companies advertise this as “32 CFM at 125 PSI”–this is not true! Displacement is the bore of the cylinder times the distance in the piston stroke times the RPM at zero pressure, but as you go up in pressure, you will lose efficiency on your pump. The CFM will diminish from 32 to 26 at 90 PSI. We give you the “Free Air” at Pressure and the CFM Displacement–NOTRICKS!!! This pump has a maximum PSI of 150. When we say ALL CAST IRON, (not aluminum) that is what we mean. It has solid cast iron cylinder, cylinder heads, crankcase, flywheel, crank, and forged steel connecting rods &###x2013; not aluminum! 99% of the pumps you see on the market today have aluminum rods. This style rod does not come close to a forged steel rod. I have seen many compressors over the 26 years of building compressors, and many of them break &###x2013; aluminum rods. However, I have NEVER seen a steel connecting rod fail in one of our pumps. These rods also have a replaceable bearing on the crank journal and on the wrist pin journal. This is what most of the competition do not have. The item “Industrial! Polar Air! 7.5HP 3 Cylinder 2 Stage Air Compressor Pump” is in sale since Friday, August 24, 2018. This item is in the category “Business & Industrial\Hydraulics, Pneumatics, Pumps & Plumbing\Pumps & Pump Accessories\Vacuum Pumps\Other Vacuum Pumps”. The seller is “eatoncompressor” and is located in Clayton, Ohio. This item can be shipped to United States.